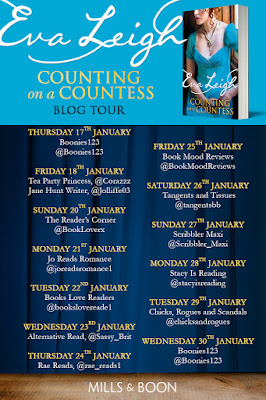 I have the great pleasure of being first in the Counting on a Countess blog tour. This is my exclusive and very first author interview with Eva Leigh. See my answer above! I did go through a few early permutations, such as book illustrator, costume designer, dramatise, and academic, but I always came back to writing. I would like to thank Eva Leigh for being my very first author, and Mills and Boon for asking me to be part of the blog tour.